MixPixParty is the ultimate party communication tool. Imagine you're at a party, the music is loud and you do not understand your own word. 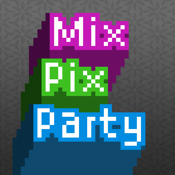 Instead of yelling you now can use MixPixParty. Just choose the appropriate symbols and share them with your friends or with the barkeeper. Use it to flirt, to order drinks or to show something to your friends. MixPixParty contains over 50 different party suitable symbols, which you can combine at will.